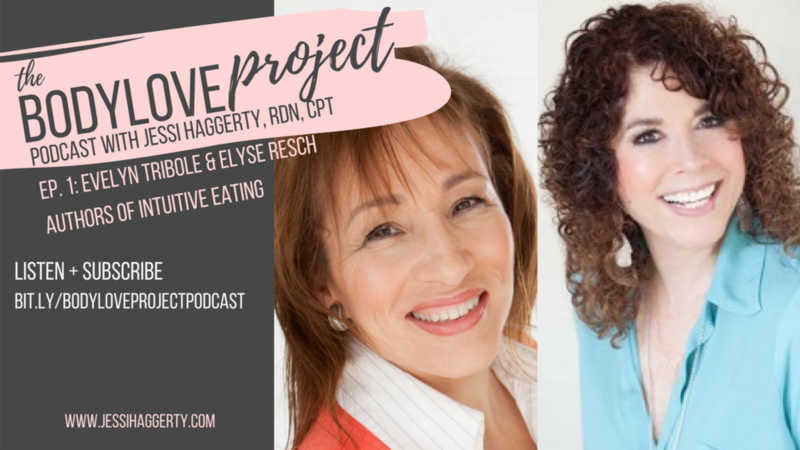 Today, I’m speaking with Elyse Resch and Evelyn Tribole, Co-Authors of the Original book on Intuitive Eating. Elyse Resch is Registered Dietitian Nutritionist, a Certified Eating Disorder Dietitian and a nutrition therapist in private practice in Beverly Hills with 35 years of experiences, specializing in eating disorders, intuitive eating, and Health at Every Size. Evelyn Tribole is a Registered Dietitian Nutritionist with a nutrition counseling practice in Newport Beach, CA, specializing in eating disorders. She also trains health professionals how to help their clients cultivate a healthy relationship with food, mind, and body through the process of Intuitive Eating, a concept she co-pioneered, with Elyse in 1995. You can find out more about their book, their new workbook, and their training for health professionals at www.IntuitiveEating.org. Perhaps you’ve heard the term Intuitive Eating before. Perhaps you’ve shrugged and thought, sounds interesting, but it wouldn’t work for me, I don’t trust myself with food. Or perhaps you’ve thought it’s too “woo woo” and “unstructured” to try. Or maybe you’ve heard the term, but being that you really need to “lose weight for health reasons” you’ve never considered it. No matter what your experience with Intuitive Eating, this episode will help establish facts and break down myths associated with the nuanced practice of Intuitive Eating. The first myth-buster being that, Intuitive Eating is not another diet. In fact, it’s more of an anti-diet. Let me explain: All diets, no matter how progressive, are structured in a way that forces followers to rely on external cues. Calorie counting. Eliminating dairy. Measuring portion sizes. Daily bootcamps. You see the pattern? Intuitive eating is a practice to teach you how to rely on internal factors… your intuition. Instead of micromanaging your meals, you now get to experience your meals, and take note of how those meals make you feel. With intuitive eating you look at your diet with curiosity instead of judgement. And through this process, you build trust with yourself. At first glance, it looks like the Intuitive Eating approach is saying, “eat whatever you want!” And in a way, it is. But the research suggests that when you ask your body what it actually wants, the answer might surprise you. This is the Paradox of Permission: when you give yourself permission to eat, you get to ask yourself if you actually like the food you’re eating. Then, you get to enjoy the food in a way that feels good for you, instead of sneaking, bingeing, or restricting. Another thing you might be thinking (and hey, I’m only assuming you’re thinking it, because I’ve thought it before) is: You’re a dietitian. Isn’t it unethical to just tell people to eat whatever they want? Aren't’ you supposed to educate people on how to make healthy choices? And the answer is DUH. Yes. As a dietitian, and a person with access to the internet, it’s obvious that all foods are not nutritionally equal. However, they do all need to be emotionally equal. Because attaching a negative emotion like guilt or shame to a specific food or type of food, is not a healthy practice either. And what about people who need to lose weight for “health reasons?” The Intuitive Eating approach focuses on Health at Every Size. That means if you’re 90 lbs, or you’re 500 lbs, or anywhere in between, you deserve to be (and can be) healthy today. Not once you lose a certain number of pounds. And while the research suggests that most Intuitive Eaters do hang out at a lower BMI, it’s considered a benign side effect of the practice, not the primary goal. At this point you might be wondering… what is the goal?!?! The goal is to get off the dieting carousel and find peace with food. The goal is to develop a healthier relationship with food and your body so you can show up for the things that matter most in your life. The goal is to clear your head of the guilt, shame, and judgement that comes with every bite of food that you put in your mouth, and use that space for something more useful, like creativity, career advancement, building relationships, or saving the world.